Jaquel Storr, CBC Marketing Associate and Nival Miller, Atlantic Medical Assistant Wellness Coordinator. 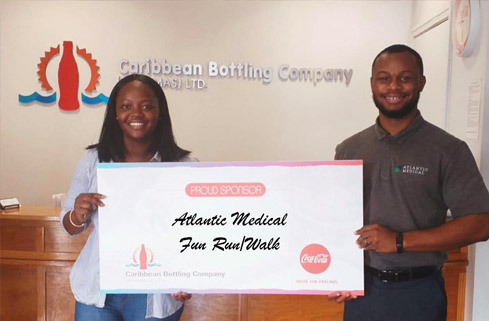 The Caribbean Bottling Company (CBC) will once again hydrate runners and walkers with Dasani water during the Atlantic Medical Insurance Co. Ltd. 21st Annual Fun Run Walk on Saturday, April 13. Over 2000 participants are expected to take part in the event which aims to encourage Bahamians, of all fitness levels, to get moving and get more active. All of the event’s proceeds will also be donated to various health centric Bahamian groups. In addition to keeping runners and walkers hydrated, the 12oz green-capped Dasani water bottles, being served at the event, are the first-ever, fully recyclable plastic beverage bottles made partially from plants. The bottles look and function just like traditional plastic, but have a lighter footprint on the planet and its resources. “In addition to supporting fitness, sporting, and community events, we are also working diligently to do our part to preserve the environment” added Wells. The Atlantic Medical organizers noted that they were extremely delighted to have CBC and Dasani back on board. Over the past several years, CBC has supported a number of Bahamian race and athletics events, around the country, including the Bahamas Half Marathon, CARIFTA, Outrun Hunger, CIBC Walk for the Cure, the Susan G. Komen Race for the Cure, Marathon Bahamas, Run for Pompey and the Powerade Potcakeman Triathlon, just to name a few.